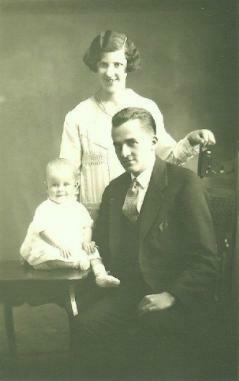 The middle son of Roland and Annie was born on 21 September 1902. After the family moved to Dunedin he finished his schooling at Arthur St and Kaikorai Schools. He went into partnership with Bill McDowell in a grocery shop on the corner of Kaikorai Valley Road and Taieri Road. Harry was a motor bike enthusiast and had several bikes until he had to sell his latest machine to finance a bacon slicer for the shop! He met Ivy Georgina Read at a grocer’s picnic and they eventually married in 1929. Three children were born to the family: Nancy Joyce, Stewart Henry and Murray George. Harry spent most of his working life in the grocery trade, both retail and wholesale, but the last several years were spent with Arthur Barnett Ltd where he was very popular and kept going back to “help out” even after several years of retirement. He read a lot but was the typical New Zealand male of his time, enjoying rugby, racing and beer. He had a happy marriage, never wanting to do anything without Ivy. He loved family outings, picnics and driving and always welcomed friends to his home. Ivy died in 1971 and Harry in 1982 and they were both cremated and their ashes interred in the plot with Rolland and Annie at Anderson’s Bay Cemetery.